a very fast underfloor heating installation, allows floorboards to be fitted same day. a dry, 45mm screed replacement, creating a thinner screed layer with absolutely no dry time. used where faster response times are important, keeping heating costs down. part of the Lithowood alternative to concrete floor slabs. Image description: This shows the specialist pipe used in the Lithotherm system. The Lithotherm system is best suited to solid floors and normally sits on top of the insulation layer. The interlocking tiles allow tiled and floating floors to be laid over the top of the system and special profiled timber battens allow floor boards to be fixed down. Can be laid over Foamglas aggregate to create floors without concrete slabs. Lithotherm underfloor heating tiles are 500 x 280mm and 45mm thick, they cover an area of 0.14 m² per tile meaning there are 7.1 tiles per m². Allow at least 5% for wastage depending on the complexity of the layout. When laying the Lithotherm UFH System on to insulation it is important that the substrate is solid and does not move. 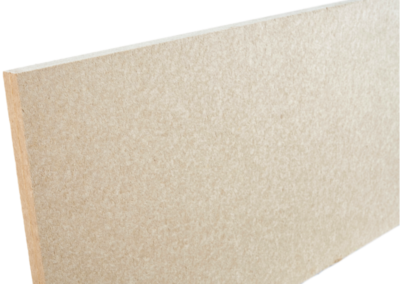 If laying directly on to a concrete floor it is advisable to use a thin layer of an underlay material, such as the UdiSTEP wood fibre product. For tiled or floating floor applications the interlocking Lithotherm tiles are laid in a brick bond pattern across the floor, leaving a 15cm perimeter at the ends of each pipe run to allow the pipes to loop round. For more information please see the installation video (A very good graphic guide but text currently only in German) and click here for more detailed instructions. The tiles weigh 65kg per m² or around 9.15kg per tile. When used on suspended floors this weight must be considered as part of the loading. The Lithotherm tiles are not designed to be a thermal insulator, infant they are quite the opposite and designed to disperse heat as well as possible. However, their thermal conductivity is around 0.89 W/mK. 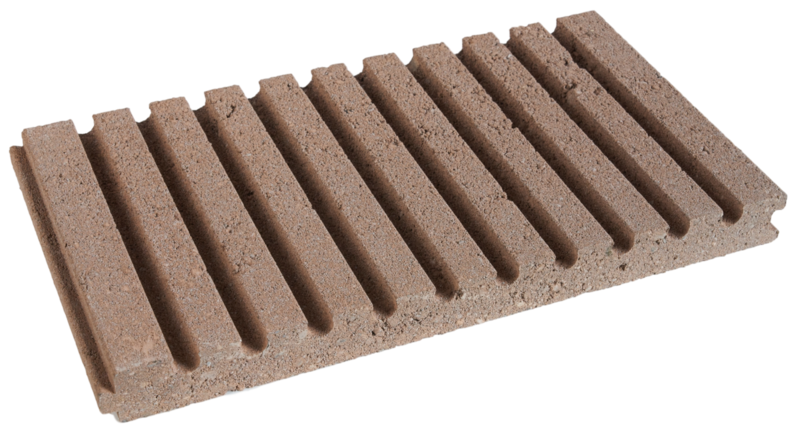 The Lithotherm tiles have a compressive strength of 9.64 N/mm² so are stronger than a normal concrete block. They have a flexural strength of 2.03 N/mm². Watch this guide for an overview. Allow at least 5% for wastage depending on the complexity of the layout.. Here you can see Ken Malins applying the mesh and flexible tile adhesive to bond the surface of the tiles together and allow the laying of the intended tiles. This installation was on a suspended first floor structure within a Carpenter Oak timber framed house. Each tile is 45mm thick and 500mm long and 280mm wide, 0.14m2. Each pallet contains 108 tiles or 15.12m2.